Roy Moore: NFL Protesters Are Breaking The Law - Joe.My.God. Senate candidate Roy Moore believes that professional athletes who take a knee during the national anthem are breaking the law. In an interview with TIME magazine, the Alabama Republican argued that NFL players and others who have protested police violence are violating a section of the U.S. code which outlines how people should conduct themselves when the anthem is played. “It’s against the law, you know that?” he said. “It was a act of Congress that every man stand and put their hand over their heart. That’s the law.” “If they didn’t have it in there, it would just be tradition. But this is law,” he said. “If we disobey this, what else are we going to disobey? 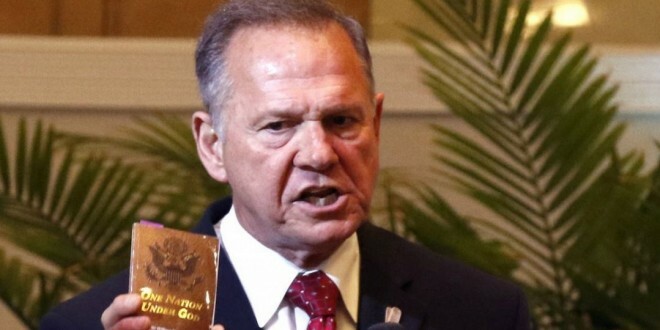 Even right wingers are mocking Moore on this. A state supreme court justice who DIDN’T get removed from his seat due to blatant disregard for the law, you mean. Except he’s not reading the Code right. 301 only suggests what individuals should do during the anthem. Operative word being “should.” If it said “shall,” it’d be binding. This dictates simply what is proper. Complete misreading by Moore.